I have a problem when installing their two software (iPi Mocap Studio, iPiRecorderSetup), since it requires me to have .Net, and even then I do not install the .Net version that it requires. Nor does it detect the version that I supposedly have installed, so I'm in a dilemma in making your software work, is it really for Windows 10? Yes, our software is fully compatible with Windows 10. I guess there's some problem with detection of installed version of .NET framework on your system. What's your exact Windows version (listed in About pane of Settings app)? Windows 10 starting from Creators Update already has .NET Framework 4.7 or above pre-installed. Build 10240 (version 1507) is a pretty old build of Windows 10 dated by 2015. And indeed it's not supported by .NET 4.7. The earliest version supporting .NET 4.7 is Anniversary Update (1607, build 14393). 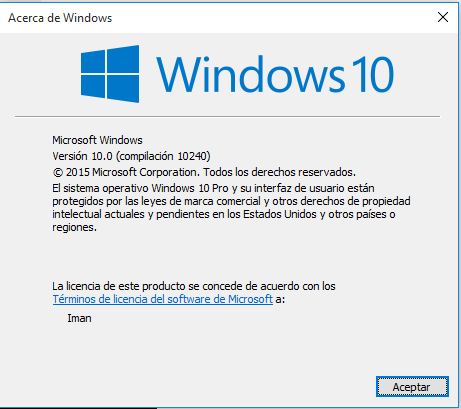 Is there a reason you cannot update your Windows 10 installation? System.Configuration.ConfigurationErrorsException: Configuration system failed to initialize ---> System.Configuration.ConfigurationErrorsException: An error occurred loading a configuration file: Method not found: 'System.Xml.XmlNodeType System.Xml.XmlReader.get_NodeType()'. (C:\Windows\Microsoft.NET\Framework64\v4.0.30319\Config\machine.config) ---> System.MissingMethodException: Method not found: 'System.Xml.XmlNodeType System.Xml.XmlReader.get_NodeType()'.